Our Pre-Kindergarten preschool class is a bridge between our preschool and Pre-K/ Kindergarten programs. The Pre-Kindergarten integrative curriculum is literature based and supports Piaget’s theory that a child’s curiosity drives learning. Open ended exploration combined with activities such as guided/shared reading, journals, problem solving, reasoning and observation are incorporated into the curriculum. Pre-reading skills and phonemic awareness and writing skills are introduced through the Harcourt Language Arts program and the Handwriting Without Tears program. Children in our Pre-Kindergarten class have a growing curiosity about the word. 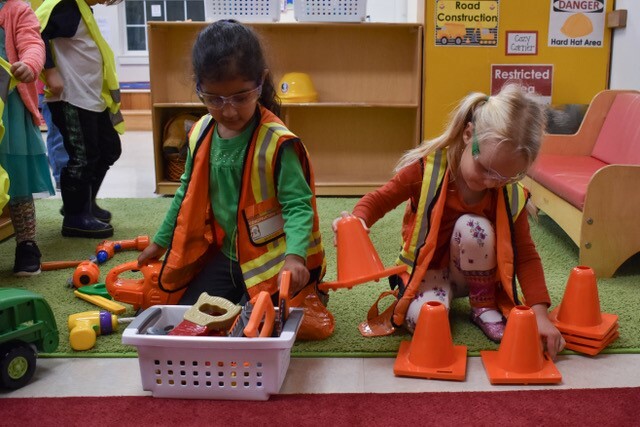 In large group, small group and one-on-one settings, children learn how to share feelings, organize cooperative play, manage conflict, pose problems and discover the solutions! Literacy: Children will read Scoop, Seesaw and Raise by Michael Dahl and create their own seesaw on the playground. Science: What is a fulcrum? Creating a marshmallow launch. Art: Painting with the wheels of a car. Math: Measure the length of our tire tracks with a cloth tape measure: which are the longest; shortest; equal? Social/Emotional: A Shy Bunny and a Curious Bunny puppet show: How do we politely decline and invitation to play?